Positions Available - APPLY ONLINE! Halloween is an exciting and much anticipated holiday tradition for children of all ages (and some adults, too). Halloween is a time to be anyone you want to be: Wonder Woman, The Incredible Hulk, or maybe even Spongebob Squarepants. Friends, family members, and strangers give out candy and treats just because you say “Trick or Treat”. Who isn’t excited when September becomes October and Halloween is rapidly approaching? For parents of children with Autism, Halloween can be a time of doubt, worry, or frustration. Doubt about whether or not to include little Mike in the Halloween festivities. Worry about if little Nathan will keep his costume on. Frustration that little Sarah doesn’t behave like the other trick or treating children. A diagnosis of Autism does not mean your child can’t participate in Halloween. Children with Autism can learn to participate in Halloween festivities with some assistance and a little pre-holiday preparation. 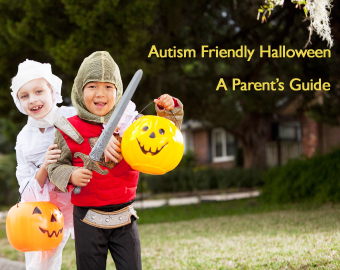 Give yourself plenty of time before the holiday approaches to start preparing for the accommodations your child may need in order to have a fun and safe Autism friendly Halloween. Below are some simple steps you can take to make Halloween a less stressful time for everyone. Let your child have a choice in their Halloween costume. Many children with Autism have sensory deficits that affect how comfortable they feel in certain pieces of clothing. A cape that is tied around the neck may be out of the question or a full mask that covers the entire face might be frightening. It’s better to know in advance about all of the potential setbacks rather than on the day of Halloween. Have your child try on a few costumes and observe to see if they pull or tug at the costume, or want to remove it after a few minutes. If your child refuses to wear any costume, consider letting them trick or treat in pajamas or regular clothing. Many children with Autism have food allergies or sensitivities or may be on special diets. If candy is out of the question for any reason, consider asking neighbors and friends to give them stickers, baseball cards, or non-candy food treats such as cheese crackers. You can also only take your child trick or treating to homes of family and friends, so you can control what is given to them (such as gluten-free pretzels). Safety is a concern on Halloween for all children, but especially for children with Autism. Take all necessary precautions to ensure that your child remains safe at all times. Be sure to dress in bright colors if you will be trick or treating at night. Go to familiar, brightly lit neighborhoods where the homes are close together. Avoid dark, heavily wooded, or unknown areas. 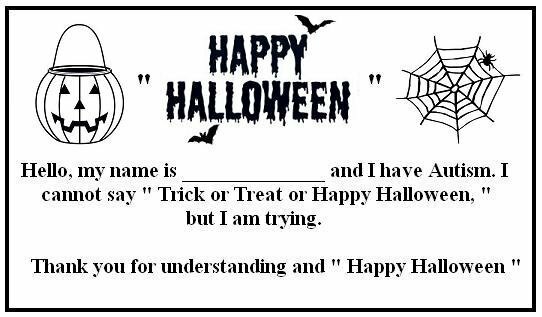 Place a sticker or some other identifying mark on the costume especially if your child wanders away and doesn’t respond to their name. Be sure to hold their hand tightly especially when walking in crowds. Periodically remind your child during trick or treating that they must stay with you, and provide a big smile or praise when they follow your instructions. Bring a spouse, a friend, caregiver, aide or a family member with you as you take your child trick or treating. Halloween night is full of noisy children, colorful costumes, candy and treats to carry, and lots of people outside, and a child may become overwhelmed or overexcited. If this happens, it will be a great help to have someone else there to help manage your child’s behavior. The last tip is to relax, have realistic expectations, help your child participate as fully as they can, and to remember why you are doing this: to have fun with your child. If your child has a tantrum in a neighbor’s yard or throws their mask into some bushes, that’s okay! The point of taking your child trick or treating is so they can learn to enjoy the Halloween festivities as much as other children do. Be sure to laugh often, tell your child they are doing a great job, and eat lots of chocolate. Behavior Frontiers offers solutions to help children with autism and other special needs reach their potential using our state-of-the-art applied behavior analysis (ABA) training and treatment programs. Contact us and get started today! Copyright © 2019 Behavior Frontiers. All Rights Reserved. Behavior Frontiers is a leading provider of Autism ABA Treatment. Behavior Frontiers offers solutions to help individuals with autism and other special needs reach their potential using our state-of-the-art applied behavior analysis (ABA) treatment programs.